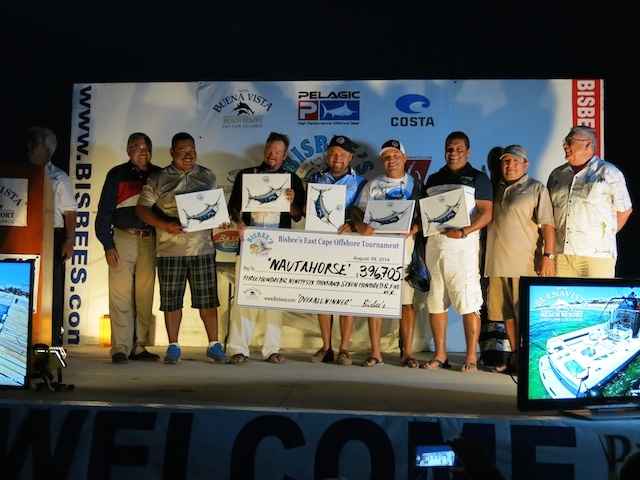 Team Nautahorse, led by angler Hector Guijarro Tomayo, raced to the finish line on the last day of the 2014 Bisbee’s East Cape Offshore Tournament to win the top purse by a bill. The team’s 323-pound blue marlin caught Friday afternoon swept the marlin category and all three daily jackpots for a $396,705 payout, which is the single-boat record for the tournament. Mick Thompson is the captain of Nautahorse, a 40 Cabo Express based in San Jose. The field of 61 boats were vying for $554,925 in overall prize money in this year’s contest. Manel Cadena, fishing aboard Pocoyos, a 28 Pursuit, also finished strong on the tournament’s last day. Cadena’s 45.7-pound dorado was the biggest in that game fish category. Including Thursday’s rollover, when no dorado were recorded, Pocoyos is taking home $57,010 in prize money. Rodolfo Luque, fishing aboard Oso Loco, pocketed $22,100 in the daily prize money for his 39.2 dorado captured on the first day. Team Zhao, with Roberto Beltran on the rod, landed the heaviest tuna overall and claimed two daily prizes for a yellowfin weighing 61.8 pounds. That effort was worth $57,100 to the team competing aboard the 23 Parker center console. Erick Esteves Durante, fishing for Team Handymen, isn’t going home empty-handed either. His 46.6-pound tuna landed on Wednesday is worth $22,100 for the top daily tuna. K Sea was named the top catch and release boat for the week. The team accrued 1,100 points aboard the Ocean 48 by releasing three blue marlin and two sailfish. Dream Weaver was the second-best team after letting two blue and one striped marlin go. Team Brothers was a strong challenger but came up short based on time. They released a blue and striped marlin and three sailfish during the three days of fishing. Fleet-wise, a total of 31 blue marlin, 32 striped marlin, 16 sailfish and one black marlin were released. Two blues were boated (with only one qualifier), for an overall 97.5 percent release ratio. The East Cape Offshore is the first in the series of three Bisbee’s Baja big-game tournaments. Next on the schedule is the Los Cabos Offshore, to be held in Cabo San Lucas on October 17-19. Like the ECO, its format also includes categories for tuna and dorado. The Black & Blue, the richest sportfishing contest in the world, also held in Cabo, runs October 21-25. Anglers competing in the B&B only fish for blue and black marlin, plus billfish release points.